GSWA has been conducting stream monitoring for more than 15 years and we are the only entity, non-profit, corporate, or government monitoring the five main streams of the Great Swamp Watershed and Passaic River on a consistent basis. Our Director of Water Quality Programs works with a team of 30+ volunteers to monitor the water quality of our watershed streams by conducting chemical, macroinvertebrate, visual, and bacteria assessments. We visit sites at regular intervals each year, building a large body of data which forms the basis for much of our programming. Findings are compiled into our annual Great Swamp Watershed Report Card. You can view our 2018 report card. We currently monitor 16 locations annually for a suite of chemical parameters. Nitrogen and Phosphorous: Although these are naturally occurring elements, they can enter the water in excessive amounts due to their presence in fertilizers and other household products. The surplus of nutrients in the water leads to rapid algal and plant growth, depleting the waters stores of dissolved oxygen. This process is called eutrophication. Dissolved Oxygen: High dissolved oxygen levels are necessary for fish and macroinvertebrate life. pH: A healthy streams pH, or how acidic or basic the water is, is between 6.5 and 8.5 (7 is perfect). A variance in pH below or above those levels can result in the death of aquatic life. Total Dissolved Solids and Sodium: We use total dissolved solids and/or sodium, depending on the site, as a measurement of how much road salt is present in the water. Road salt can enter the water from stormwater runoff on roads and bridges after it’s been applied to the road. We have found elevated levels of road salt in the streams in all seasons but, not unexpectedly, the highest levels occur in the winter months. A planaria glides through the lower right corner of a water sample taken from the Passaic River. Benthic macroinvertebrates are water-dwelling invertebrates, such as mosquito larvae, water striders, or crayfish, which we use to gauge long-term water quality. Because each different species of macroinvertebrate has a different pollution tolerance threshold, we can analyze the species present in a stream to determine its overall health. While our chemical testing gives us a snapshot of what is happening in the water the day we test, testing macroinvertabrates allows us to see long term effects of water quality on the living community in our streams. We monitor for macroinvertebrates once a year in the summer throughout the Great Swamp Watershed and Passaic River. You can learn more about our macroinvertebrate findings in our most recent report card. In 2015, we began a coliform and E. coli bacteria testing program using the state recommended IDEX system. 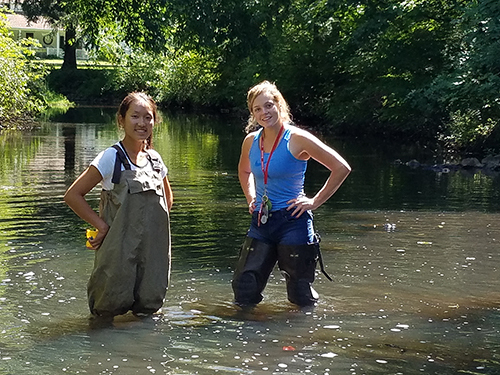 Our Stream Team volunteers collect samples from their designated site once a week for five weeks from the middle of July through early August. We have chosen our bacterial monitoring sites to align with where people interact with our streams. We have found a pronounced increase in bacteria levels at most sites following any rainfall significant to cause run-off. Most likely, bacteria enter the streams from animal waste carried by surface water, especially in places with large areas of impervious surface which can include paved driveways, the roofs of buildings, and repeatedly mowed lawns. Bacteria in our waters at elevated levels can be a danger to people and animals that come in contact with or drink the water. Building buffers around ponds and stream banks discourages Canada geese populations for grazing on nearby lawns which can be a source of bacteria in waterways. Also, be sure to pick up after your pets, dog waste can also be a source of bacteria entering our waterways with runoff when it rains. We will be monitoring for bacteria at 15 sites in the Great Swamp Watershed and Passaic River in 2017. If you are interested in volunteering for this project please contact Sandra LaVigne, Sandral@greatswamp.org. You can learn more about our bacteria findings in our most recent report card. GSWA volunteers conduct visual assessments on designated sites throughout the Great Swamp Watershed and Passaic River. During a visual assessment, volunteers record information such as stream depth, width, nearby land uses, and the presence of stream bank erosion (and report on the presence of pollutants or hazards). Visual assessment data is used by GSWA to keep an eye on our streams and note new problems, site improvements, and possible sites for restoration. All of this data helps to generate a picture of the overall health of our streams and our environment in general. New volunteers are always needed to conduct visual assessments. After a full training session, volunteers are asked to conduct visual assessments of their assigned stream section two times per calendar year. One assessment needs to be conducted in April or May and one must be conducted in October or November: The minimum time commitment is one year. We will provide most of the necessary equipment. All assessments will be conducted by at least two people for safety reasons. The time needed to complete one assessment is estimated to be 2-3 hours, including driving time from GSWA office to and from the site. We hold training sessions twice a year in March and October with the assistance of our NJDEP Watershed Ambassador. If you are interested, please contact Sandra LaVigne at (973) 538-3500 or sandral@greatswamp.org.